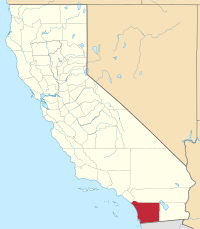 San Diego County, officially the County of San Diego, is a county in the southwestern corner of the state of California, in the United States. As of the 2010 census, the population was 3,095,313.  making it California's second-most populous county and the fifth-most populous in the United States. 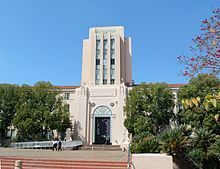 Its county seat is San Diego,  the eighth-most populous city in the United States. It is the southwesternmost county in the 48 contiguous United States. 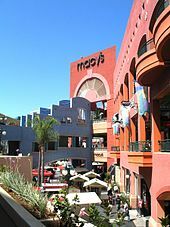 San Diego County comprises the San Diego-Carlsbad, CA Metropolitan Statistical Area,  which is the 17th most populous metropolitan statistical area and the 18th most populous primary statistical area of the United States as of July 1, 2012. 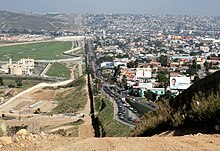 San Diego is also part of the San Diego–Tijuana metropolitan area, the largest metropolitan area shared between the United States and Mexico. Greater San Diego ranks as the 38th largest metropolitan area in the Americas. San Diego County has more than 70 miles (110 km) of coastline. This forms the most densely populated region of the county, which has a mild Mediterranean to semiarid climate and extensive chaparral vegetation, similar to the rest of the western portion of southern California. Precipitation and temperature extremes increase to the east, with mountains that receive frost and snow in the winter. These lushly forested mountains receive more rainfall than average in southern California, while the desert region of the county lies in a rain shadow to the east, which extends into the Desert Southwest region of North America. In 1542, the explorer Juan Rodríguez Cabrillo, who may have been born in Portugal but sailed on behalf of Spain, claimed San Diego Bay for the Spanish Empire, and he named the site San Miguel. In November 1602, Sebastián Vizcaíno surveyed the harbor and what are now Mission Bay and Point Loma and named the area for Saint Didacus, a Spaniard more commonly known as San Diego. European settlement in what is now San Diego County began with the founding of the San Diego Presidio and Mission San Diego de Alcalá by Spanish soldiers and clerics in 1769. This county was part of Alta California under the Viceroyalty of New Spain until the Mexican declaration of independence. From 1821 through 1848 this area was part of Mexico. During the later part of the 19th century, there were numerous changes in the boundaries of San Diego County, when various areas were separated to make up the counties mentioned above. The most recent changes were the establishments of Riverside County in 1893 :207 and Imperial County in 1907. :113 Imperial County was also the last county to be established in California, and after this division, San Diego no longer extended from the Pacific Ocean to the Colorado River, and it no longer covered the entire border between California and Mexico. San Diego County has a varied topography. On its western side is more than 70 miles (110 km) of coastline. Most of San Diego between the coast and the Laguna Mountains consists of hills, mesas, and small canyons. Snow-capped (in winter) mountains rise to the east, with the Sonoran Desert farther to the east. 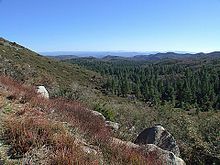 Cleveland National Forest is spread across the central portion of the county, while the Anza-Borrego Desert State Park occupies most of the northeast. 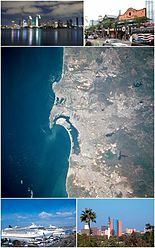 Under the Köppen climate classification system, the urban and suburban San Diego area straddles areas of Mediterranean climate (CSa) to the north and semi-arid climate (BSh) to the south and east. As a result, it is often described as "arid Mediterranean" and "semi-arid steppe." Farther east, arid desert conditions prevail. Western San Diego's climate is characterized by warm, dry summers and mild winters with most of the annual precipitation falling between November and March. The city has mild, mostly dry weather, with an average of 201 days above 70 °F (21 °C) and low rainfall (9–13 inches (23–33 cm) annually). Summer temperatures are generally warm, with average highs of 70–78 °F (21–26 °C) and lows of 55–66 °F (13–19 °C). Temperatures exceed 90 °F (32 °C) only four days a year. Most rainfall occurs from November to April. Winter temperatures are mild, with average high temperatures of 66–70 °F (19–21 °C) and lows of 50–56 °F (10–13 °C). The Government of San Diego County is defined and authorized under the California Constitution, California law, and the Charter of the County of San Diego. Much of the Government of California is in practice the responsibility of county governments such as the Government of San Diego County. The County government provides countywide services such as elections and voter registration, law enforcement, jails, vital records, property records, tax collection, public health, and social services. In addition the County serves as the local government for all unincorporated areas. Some chartered cities such as San Diego and Chula Vista provide municipal services such as police, public safety, libraries, parks and recreation, and zoning. Other cities such as Del Mar and Vista arrange to have the County provide some or all of these services on a contract basis. 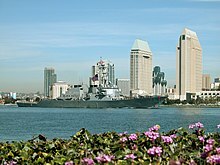 San Diego is the headquarters of the U.S. Navy's Eleventh Naval District and is the Navy's principal location for West Coast and Pacific Ocean operations. Naval Base San Diego, California is principal home to the Pacific Fleet (although the headquarters is located in Pearl Harbor). NAS North Island is located on the north side of Coronado, and is home to Headquarters for Naval Air Forces and Naval Air Force Pacific, the bulk of the Pacific Fleet's helicopter squadrons, and part of the West Coast aircraft carrier fleet. The Naval Special Warfare Center is the primary training center for SEALs, and is also located on Coronado. The area contains five major naval bases and the U.S. Marines base Camp Pendleton. Marine Corps Base Camp Pendleton is the major West Coast base of the United States Marine Corps and serves as its prime amphibious training base. It is located on the Southern California coast, bordered by Oceanside to the south, San Clemente to the north, and Fallbrook to the east. San Diego County is served by many newspapers. The major regional paper is The San Diego Union-Tribune, also known as U-T San Diego, is ranked 23rd in the country (by daily circulation) as of March 2013. The Union-Tribune serves both San Diego County and neighboring Imperial County. The former North County Times, based in Escondido and serving portions of Riverside County and North County, was purchased by the Union-Tribune in 2012 and closed down. For about a year after absorbing the North County Times the Union-Tribune published a North County edition,  but the regional edition was later abandoned. The Los Angeles Times is also delivered in portions of the county. Many of the area's cities, towns and neighborhoods have their own local newspapers; the Union Tribune bought eight local weeklies in 2013 and is continuing to publish them as independent local newspapers. The San Diego Daily Transcript reports business and legal news. Privately published papers like the Military Press Newspaper and the Navy Dispatch serve the military community both on and off base. San Diego County has 18 federally recognized Indian reservations, more than any other county in the United States. Although they are typical in size to other Indian reservations in California (many of which are termed " Rancherías"), they are relatively tiny by national standards,[ citation needed] and all together total 200.2 sq mi (519 km2) of area. ^ M. Kottek; J. Grieser; C. Beck; B. Rudolf; F. Rubel (2006). "World Map of the Köppen-Geiger climate classification updated". Meteorol. Z. 15: 259–263. doi: 10.1127/0941-2948/2006/0130. Retrieved April 22, 2009.